"Song for Europe" 10 November. 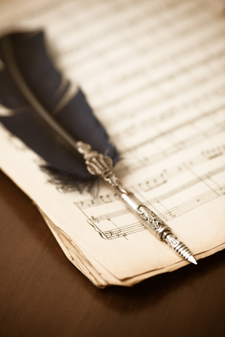 A celebration of 500 years of European choral music. "Hands of Friendship" 21 July. We were delighted to be asked to sing alongside Gay Abandon as guest performers at their 20th anniversary celebration concert at the Leeds College of Music. A great night was had by all! When the Drums Begin to Beat: 19 May. Completing our 10th Anniversary celebrations, this was a performance showcasing '800 years of new music' - music that, one way or another was revolutionary in its day. The performance included the world premier of 'The Juggler' - a lively and innovative piece by London-based composer Christopher Schlect Bond, and commissioned by the choir as part of our anniversary celebrations. "Cantabile Ten" Saturday 18th November. A musical celebration of the choir's tenth anniversary, featuring music selected by the choir from our full repertoire. Saturday 24th June. 'Approaching Nocturne', A group of artists came together to respond to Cantabile's programme, which explored the theme of night. The artwork included drawing, sculpture, soundscape and dance with live performances by the choir throughout the afternoon. .
Sunday 23rd July: Ellerton Priory, East Yorkshire. 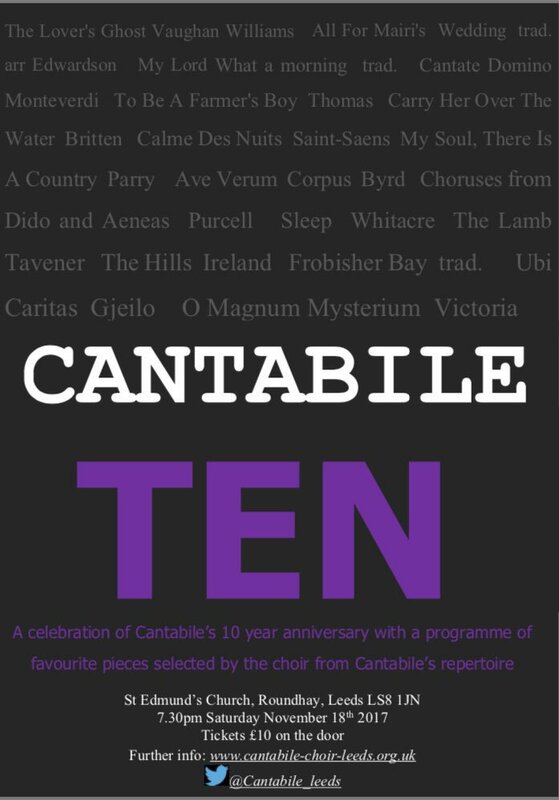 Saturday 18th November "Cantabile Ten" Highlights from throughout Cantabile's 10 years. St Edmunds, Roundhay, LS8 1JN. Sunday 17th July, 3.00 pm: Ellerton, East Yorkshire. Saturday 22nd October: "Come and Sing! ": Handel's coronation anthems, All Saints Pavement, YO1 2NA. Rehearsal begins 2.15 pm, concert at 6.00 pm. Saturday 10th December, 3 - 5 pm: Christmas music at Fountains Abbey. Sunday 5th July 2015: 'Arcadia' concert: Ellerton, East Yorkshire (YO42 4PD, 3 pm). Saturday 7th November: "Come and Sing! ": 'Gloria': St Helen's Stonegate, York, YO1 8QN. Concert starts 6pm. Saturday 19th December: Christmas concert: 3.30 pm at Fountains Abbey.